We’re all prone to a bit of pettiness from time to time, aren’t we? Not offering to make a colleague a cup of tea. Not texting someone because of a perceived slight. Usually, this is caused by a power imbalance or by getting your own way. You can either deal with it like a mature adult and or you can sulk, stick out your bottom lip and strike back the only way you can: pettiness. 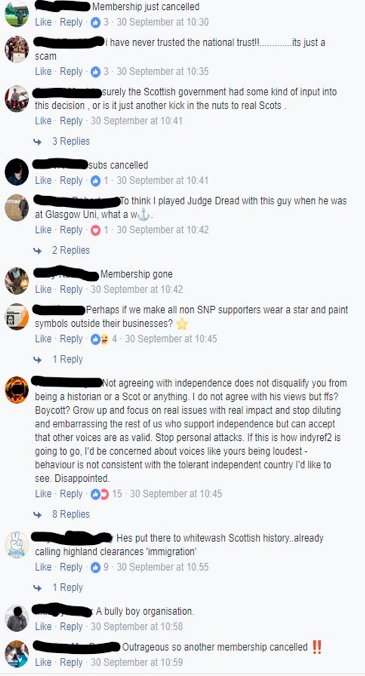 At the moment, there is a virulent, petty streak in Scottish nationalism that is becoming increasingly desperate. With Scottish independence receding into the distance, many nationalists are resorting to desperate and increasingly ridiculous stunts in order to resuscitate their moribund cause. The harbingers of such future pettiness were present during the 2014 Scottish independence referendum. Discussion of the boycott of companies that supported a ‘No’ vote in 2014 was rife during the run-up to September 18th 2014. BP, Shell, William Grants, BAE, RBS, Lloyds, B&Q, John Lewis, Marks and Spencer’s, the BBC, Thomas Cook and Standard Life all voiced concerns over a ‘Yes’ vote and were to be boycotted. ASDA had the temerity to voice some unofficial reservations over their operations in Scotland post-independence. They were met with cries from the cybernats including: ‘Well ye wid side with the enemy fool hope yeez go out of business altogether and let the local shops rule again’ and ‘Still think NAW was the right idea ASDA? Traitors !!!! !.’ The notion of corporations being ‘traitors’ in Scotland is a relatively new phenomenon and one that is a common feature amongst the most zealous. One would like to think that after the referendum, a period of calm would have ensued. After all, ultimately, we were talking about our sense of identity. 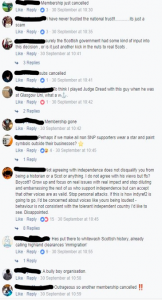 However, a week later, the pro-independence group, ‘The 45’ were formed and soon released a large list of brands that should be boycotted immediately. 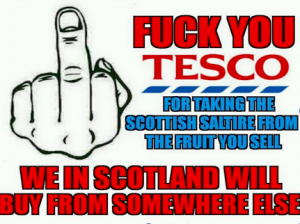 The most infamous display of nationalist pettiness was the January 2016 boycott of Tunnocks, which had supposedly removed the lion rampant from the packaging of its teacakes. It turned out they actually hadn’t, but this was irrelevant. Such a flagrant display of a company exercising its right to manage its affairs was met by the 24th Central-belt cybernat regiment, (The blue and white line, tipped with bile) who bravely tweeted ‘join me in boycotting #Tunnocks. Bad product anyway, Calories galore, no nutrients’ another keyboard warrior stated that ‘On principle, I haven’t bought anything by #Tunnocks since 2014.’ Dark days for Scotland when a grown man refuses to eat a chocolate coated, marshmallow filled confection on political ‘principle’. 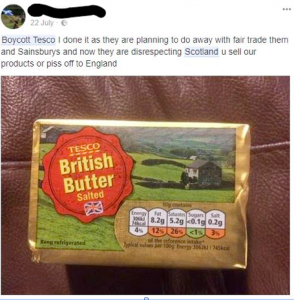 More recently Tesco has come under attack for saying that it would be putting British flags on its produce to ensure brand continuity. Again, not unreasonable. These are just products like strawberries. Scotland has a certain ‘brand’ and has foods that are associated with it including whisky, salmon, haggis, shortbread etc. So do all regions of the UK (The English do marvellous cheese pies). But soft fruits? Nothing particularly Scottish about them. However, Tesco withdrew this statement after more nationalist pettiness on social media in what A Force for Good called the ‘THE SUPERMARKET CLEARANCES’. 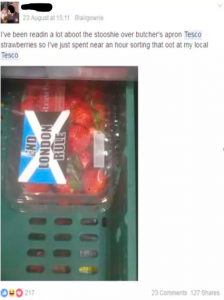 Indeed one Scottish ‘patriot’ was so enraged at the sight of the ‘Butchers Apron’ upon his strawberries that he put a sticker over the offending flag with ‘End London Rule’ on it. Again, this was a grown man. Follow the thought process he must have gone through and it’s worrying. Supermarket makes change to its packaging. Seething rage. Go to computer. Design leaflet. Acquire stickers. Print. Go to local Tesco. Place sticker on strawberries. Ignore strange looks. Write a post on social media in incoherent ‘Scoddish’ that hasn’t been spoken since 1741. Social media ‘friends’ reply. Increase in confirmation bias. Watch as reasonable Scottish nationalists distance themselves. At what point was there any self-reflection on such a monumental level of petty behaviour? 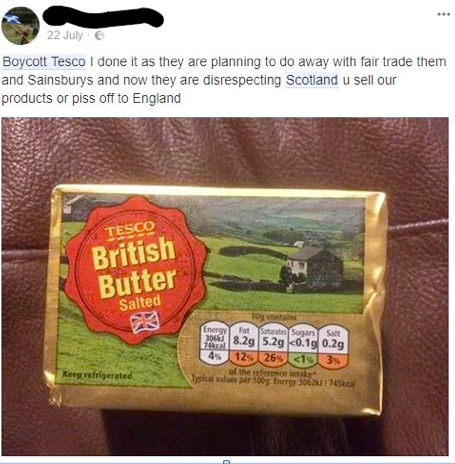 Again, this is not all of Scotland, but we should be concerned when there are people who think that a supermarket chain selling ‘British Butter’ in their stores, north of the Border are ‘disrespecting Scotland’. Such antics also extend to cultural and historical organisations now. The National Trust for Scotland has recently appointed historian Neil Oliver as their President. This has also been met with howls of indignation from many nationalists, berating the organisation with threats to cancel their subscriptions because they appointed a man who was a unionist and a very measured and polite one at that. There is probably an underlying reason for such boycotts. 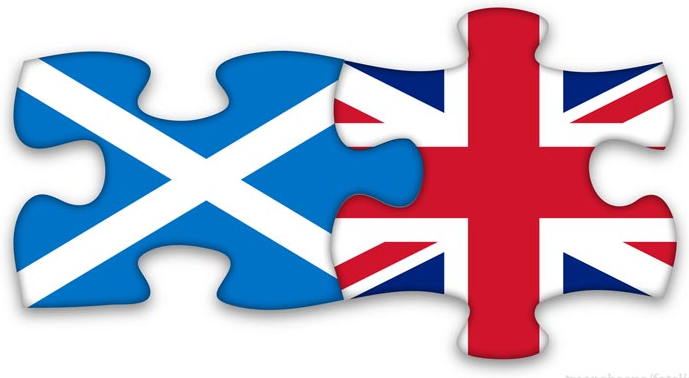 It’s another attack on ‘Britishness’ in Scotland. Either intentionally or by design, many of these companies are ‘British’. Think John Lewis, Marks and Spencer, Tesco, B&Q. Some quintessentially British. The obsession with British flags on produce is another indicator. If you can’t get a politically independent nation through democratic means, then the next best thing is to do the same thing in the cultural and economic spheres. The nationalists are losing the political and economic argument though. The SNP have had a bout of knock backs over the last few years. Companies and organisations should not be beholden to a bunch of petty nationalists. (What is the plural for a gathering of petty nationalists? A swarm? A hive? A clutter?) If you are putting political slogans over British flags, you know you have lost the argument (and the plot). Like spoiled children, the zealous nationalists are lashing out anything they deign to be British, particularly the low hanging fruit of visible identity. The best that any person or organisation can do is it to ignore them and let them have their tantrum. In a way this is a positive development. This is all they can attack now. Just because you are the loudest and the pettiest does not mean you are correct. We made the same mistake of believing it in 2014, where the silent majority didn’t make themselves present until the 11th hour. More importantly is this really the nation that Scotland is turning into? Is this what we want, not even as nationalist or unionist, but as free-thinking Scots and/or Brits? 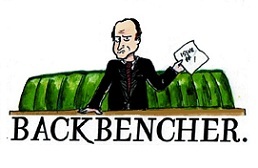 A place where butter and teacakes are viewed as ‘treacherous’ and a historical conservation organisation takes flack for appointing someone because of their benign political views? Taken to an extreme, these are dangerous trends that must be nipped in the bud. Scotland deserves much better.